All Robbinsville homes currently listed for sale in Robbinsville as of 04/22/2019 are shown below. You can change the search criteria at any time by pressing the 'Change Search' button below. "Presiding over this lovely parcel of just under 2-acres with a retreat-style backyard, and boasting a heated in-ground pool and spa and outdoor gas kitchen, is a one-of-a-kind custom stucco and stone home. This home exudes warmth and is indeed a work of art. One main feature that sets this home apart from all others is the substantial attached guest residence. This expansive living space is comparable to a condo-size property, offering four separate points of entry which include a private entrance into foyer, garage entry, main house access, and sliding doors to the conjoined patio. Inside you will find a roomy eat-in kitchen, side by side dining and living rooms, office/bedroom and Master bedroom with walk-in closet, private bath and linen closet. Amenities in these separate quarters include laundry room and extra powder room. Enter the Main home through grand arched double doors into a soaring foyer with sweeping staircase. Brazilian Mahogany hardwood floors grace the main living areas. The two-story Family room is the center of home offering two individual gas fireplaces encased in floor-to-ceiling stacked stone. Large French doors and banks of windows allow for plenty of natural light, as well as panoramic views of gorgeous sunrises and sunsets. The gourmet eat-in kitchen has Cherry cabinetry, granite counter tops, center-island and deep walk-in pantry. Professional grade stainless steel appliances with built-in refrigerator concealed behind matching cabinet front doors. The dining room is set under a tray ceiling with accent lighting and complemented by a bay window. The large office with built-ins has two sets of French doors featuring an octagonal work area surrounded by banks of windows found inside the turret portion of the home. A sizable master has a two-sided fireplace and ample walk-in closet outfitted with custom organizers. The luxurious master bath showcases travertine and tumbled stone tiling, river rock encased soaking tub, dual vanity and fireplac"
"In desirable Robbinsville, consider buying this home on a one acre envelope while you build your dream home on the buildable lot next door. For a contractor, this would be ideal because there is a spacious pole barn with electric and well, detached garages and another 9 acres . There is a large open tract of 23 acres also for sale that is contiguous to this parcel. SUBJECT TO A MINOR SUBDIVISION. The entire 33 acres is for sale." "Model home, the Sherborne, at Bear Creek estates is available for immediate occupancy.This custom built home comes with 5 bedrooms, 4 full baths, and half bath.Home comes with a 3 car side entry garage and full basement.You walk into a two story foyer with hardwood floors.Has a large great room with a gas fireplace.The home has a top of the line gourmet kitchen with granite countertops,upgraded kitchen cabinets,center island,ceramic tile flooring, breakfast nook and large pantry.The Master bedroom come with a sitting area, Jacuzzi tub,ceramic tile shower and 2 large walk-in closets.There are too many upgrades in this home to mention." 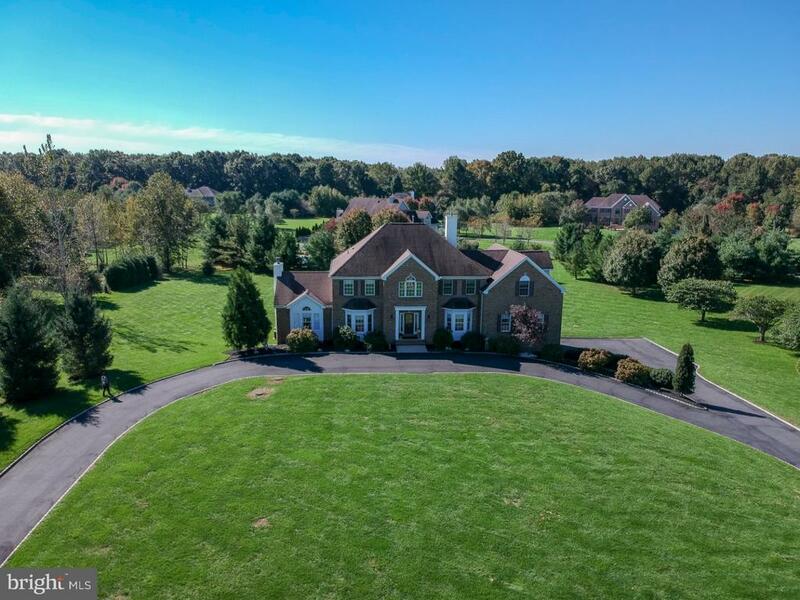 "Sweeping, tranquil views and a very private lot ~ one of the best cul-de-sac homes in ~Combs Farm~!This 4200 sf stately and elegant brick front colonial is the largest ~Hardwick II~ model built by Pulte Homes. Enter through the two story grand foyer with curved staircase, which is flanked by the library with French doors, perfect for those who like to work from home and the living room, with cathedral ceiling and palladium windows, which flows into the formal dining room with two side windows, dentil crown molding and wainscoting. Great for entertaining! The butler~s pantry, at the corner of the dining room and kitchen, makes this home perfect for large or small gatherings. The large kitchen has ample 42 inch cabinets, Corian counter tops, a large island and a spacious breakfast nook with abundant sunlight all day. Two French doors and a dramatic two-sided gas fireplace connect the two-story family room with floor to ceiling windows and the upgraded 12 FT ceiling Florida room. A perfect place to enjoy both your morning coffee and afternoon tea. The open and gracious floor plan offers great space for both everyday living and easy entertaining.The upstairs boasts 4 large bedrooms including the master suite with two walk-in closets, a luxurious master bath with Jacuzzi, separate shower, a double vanity and views of breathtaking landscaping from the floor to ceiling windows. Two other bedrooms share a Jack-and-Jill bath, and a princess suite complete the 2nd level.The large and dry basement, with 3-piece rough-in plumbing and upgraded waterproofing system, is waiting for the new owner to finish to their taste. Other great features include: 2-zone heat and A/C system, custom-made curtains, 3-car side entrance garage with insulated garage doors, 9-zone irrigation system, and custom-made paver patio with retainer wall and professional landscaping. 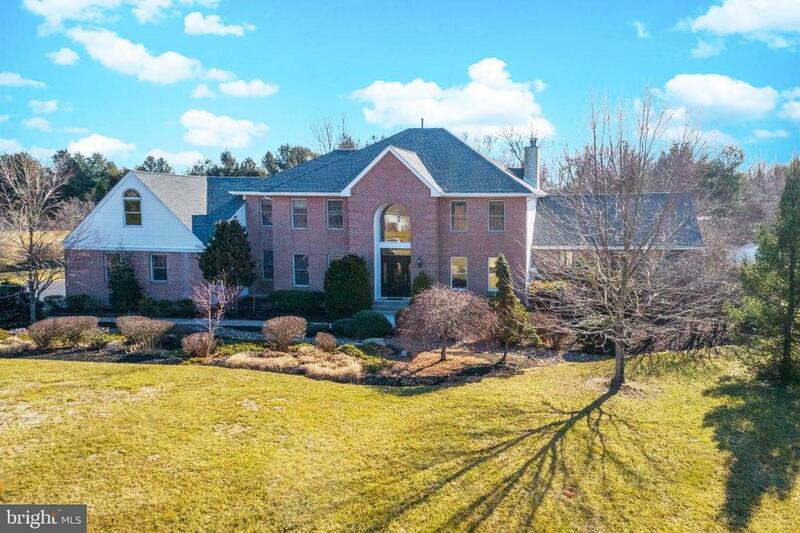 Convenient location ~ 5 miles to Hamilton train station (NJ Transit to NYC), 10 miles to Downtown Princeton, and close to Qua"
"This Stunning NorthEast facing, 5,100 square-foot custom brick Colonial is like no other in Robbinsville located in desirable Canterbury Ridge! 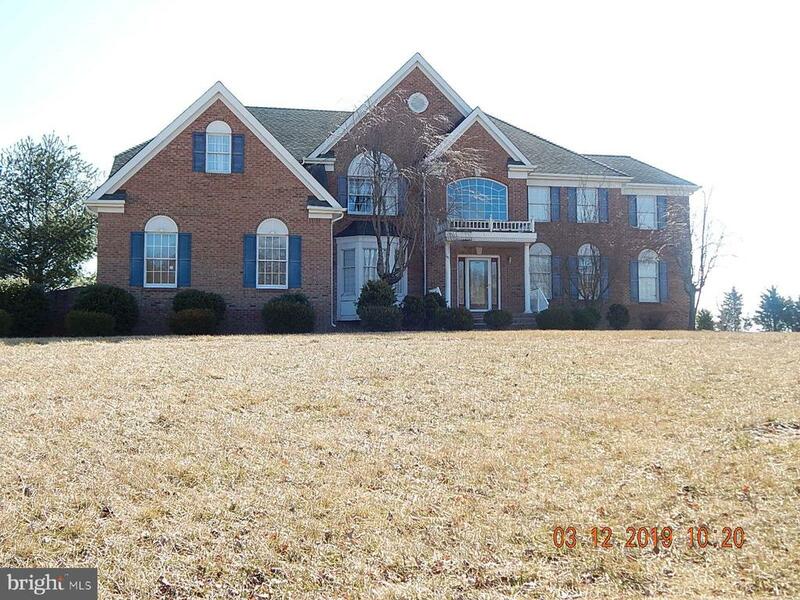 Featuring 5 bedrooms, 3.5 baths, spacious 3 car garage, newly re-paved circular driveway, all sitting on 2 acres. 5th bedroom on main floor with private full bath and separate living room perfect for in-laws, for the nanny or additional playroom. The welcoming center hall leads you into the over sized eat-in kitchen. Close to major transportation for commuters to New York and Philadelphia." "Exquisite home now available in the desirable Crestwood Acres development in Robbinsville Township! Kept in meticulous condition and with well thought out amenities for the detail oriented person, this home has all the extras needed for you and your extended family. This Expanded Cedar Model has four bedrooms including a Princess Suite, four full bathrooms (three on second floor and one on main floor), a spacious sunroom that could be converted to a bedroom, a main floor office that could be an additional bedroom, a fantastic family room that includes a gas fireplace, skylights, and vaulted ceiling, a formal living room that opens to a naturally lit family room, a granite butler's pantry connecting the kitchen to the formal dining room, and much more! The oversized master suite includes an enormous dressing room/master study, a sitting area, cathedral ceilings, two walk-in closets, and skylights in the master bathroom. The kitchen was remodeled with granite countertops and backsplash, cherry cabinets, and all new appliances. Additional skylights brighten up the kitchen eating area. The 900 square foot double-tiered, skirted Trex deck with lighting and speakers is a phenomenal place to enjoy company or spend time relaxing. Some of the available amenities include a SMART water filter system, a car lift for a third car/storage in the garage, cabinet lighting in the kitchen and laundry room, window treatments and a whole house speaker system. The 2000 sf basement is a blank canvas for you to carve out your dream space! The house was upgraded to high efficiency heating/cooling Carrier systems and new high efficiency water heater. 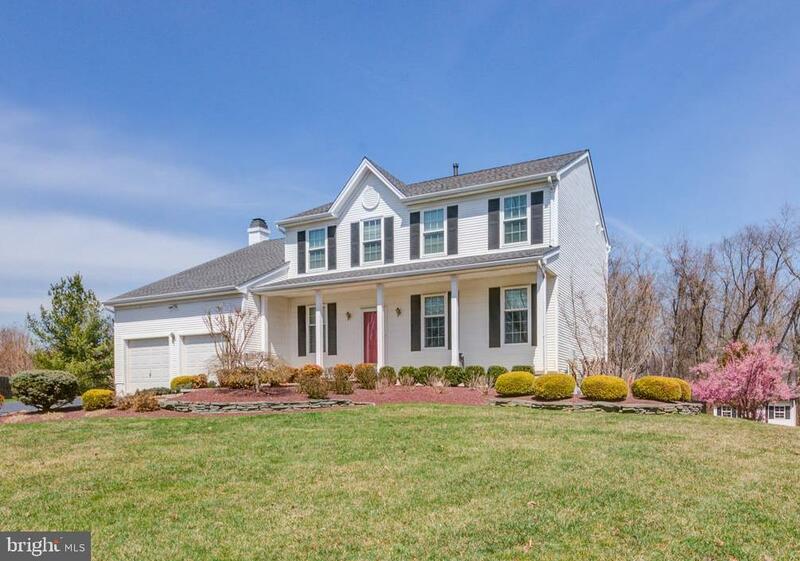 Don't miss your opportunity to tour this amazing home that offers so much including Robbinsville Schools and is conveniently located in Mercer County near major transportation!" "Fully renovated and expanded home (approximately 3,400 square feet) is under construction on almost 2 acres of land in desirable Robbinsville. Expanded floor plan that includes a both a first floor master bedroom/guest suite and a luxurious second floor master suite. Dry wall is up and work is fully underway. Take the opportunity to make your design choices now before the final stages of interior design work begins! Expected delivery is Summer 2019. Take advantage of the highly rated Robbinsville school system, the close proximity and easy access to NYC and Philadelphia roads and transportation, major highways (NJ Turnpike, I95, I295, Rt 130), shopping and restaurants. This will be a truly classic home with everything today's buyer demands"
"Master craftsmanship and extraordinary elegance abound in this custom built executive style colonial stunningly situated on a 2.67 acre lot neatly nestled on the end of a private cul-de-sac. Dramatic curb appeal draws you onto the expansive paver driveway leading directly to the eye-catching decorative front door w/beveled glass inset and matching sidelights. The two-story entry is elegant and alluring with its views of the triple archways that open to the two-story living and dining rooms showcasing a triple French door effect with unique Palladium windows atop each one and an amazing view of the loft/library located above with exquisite, yet functional built-ins. Coffered ceilings, intricate woodwork, deep moldings, recessed lighting, accent sconces, spot lighting, custom fireplace with detailed mantle and woodworking provide just a hint of the outstanding details of this remarkably crafted space. Near the entry is an office fit for a true executive with French doors, detailed coffered ceiling with lighting and speakers, custom window arrangement, chair rail and closet. The kitchen is a gourmet chef's delight with an abundance of custom cherry cabinetry, granite counters, top-of-the line appliance package (including a hidden TV), granite topped center island, butler's pantry, breakfast area with a full surround of windows overlooking lush greenery. The family room is replete with custom built-ins housing the TV and other media equipment, and ensconces the fireplace. This room also has a bank ofwindows overlooking a paver patio with gracious garden views. The master bedroom, boasts a tray ceiling w/ceiling fan, walk-in closet, large master bath with Corian topped double cherry vanity, custom Corian shower surround, heat lamp, Jacuzzi tub. The main level is completed with an elegant powder room, massive laundry area with access to the oversized, independently heated garage with three 9' wide garage doors. The second level offers 3 additional bedrooms, one of which h"
"There Are Homes and There Are Remarkable Residences! From the moment you enter the welcoming two-story foyer you will know this home is a stunning departure from the ordinary. Amenities and quality workmanship, rich in detail, abound. Perfectly situated on approximately 2 lush landscaped acres in the desirable Robbinsville community of The Ridings, with views of preserved open space. Enjoy hours of pleasure in your resort-like backyard with heated pool, firepit with garden, and for the golf enthusiast a green with three holes. This home is shown with pride and boasts so many upgrades including magnificant custom woodworking throughout, newer porcelain wood-look tile on entire 1st floor level, new carpeting on 2nd level, Califoria closet systems, new engineered hardwood flooring in upstairs foyer, and beautifully updated baths. The family room with its warm and friendly fireplace w/Onyx surround and custom mantel has French doors leading to a sun-drenched Florida room. The spacious island kitchen with bay window has new Quartzite countertops, new backsplash and sink with stainless steel appliances and pendulant lighing is sure to please every chef. Retire to the master bedroom and enjoy the two-sided gas fireplace. The Piece de resistance is the impeccably finished lower level adding plenty of versatile living space with attractive newer eat-in kitchen, custom moldings, raised ceiling height, full bath with gorgeous tile work, great room, playroom and more. This Friendly Home Planned For Gracious Living and Entertaining won't disappoint. Charm, Convenience and Location, this home has it all." 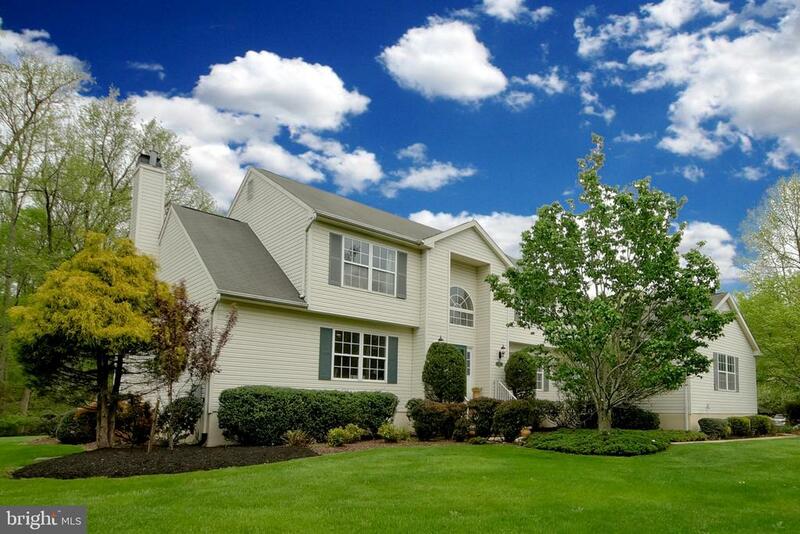 "Elegant and Spacious Colonial located in a Tranquil Setting awaits its new owners! Lovingly maintained by the original owners, this brick front home is situated in a small enclave of custom built homes. Two story foyer features a curved staircase, palladian window, granite tile flooring, and a crystal chandelier. Formal living and dining room have decorative molding and hardwood floors. Grand two story family room offers hardwood floors, wood burning fireplace, and a balcony overlook. Stunning kitchen has plenty of cherry cabinets, large center island, granite counter top, Sub Zero refrigerator, double wall oven, and granite tile back splash. Adjacent to the kitchen is the breakfast area with bay windows that overlook the expansive private backyard. First floor master bedroom suite is complete with its own gas fireplace, sitting area, walk in closet, and sumptuous bath that includes double vanity/sink with marble top, marble tile flooring, jetted tub, and separate shower stall. All the other bedrooms are on the second floor and are sized generously - 2nd bedroom has its own full bath with marble tile flooring; 3rd bedroom offers a large walk in closet; 4th bedroom has a balcony that overlooks the serene backyard. Another full bath with soap stone counter top and marble tile flooring is also on this level. Not to be missed at the end of the hallway is a beautiful 22' X 19' multi purpose room (with hardwood floors) that is ideal for media/recreation or office. Large basement has finished areas, a cedar closet, and an unfinished section for storage. The private backyard offers a variety of ornamental trees, perennials and shrubs, a composite deck and in ground pool. Recent updates have been done to make this home truly turn key: roof 10/2018, interior painted 10/2018, 2 zone heat/ac (2016), hot water heater (2018), carpets (10/2018), Generac generator (2012), pool liner (2017). All this within minutes to schools, shopping, major roads such as Rt. 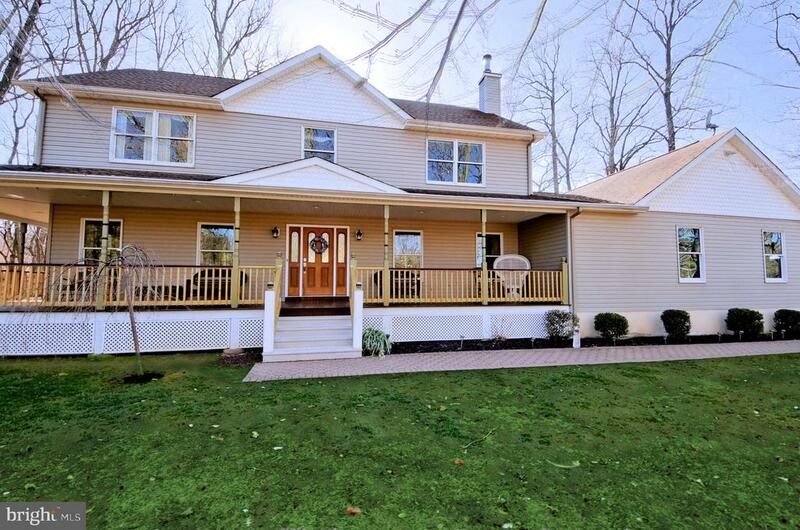 130, NJ"
"QUALITY FINISHES, COUNTLESS UPGRADES & SPACE TO ENTERTAIN! 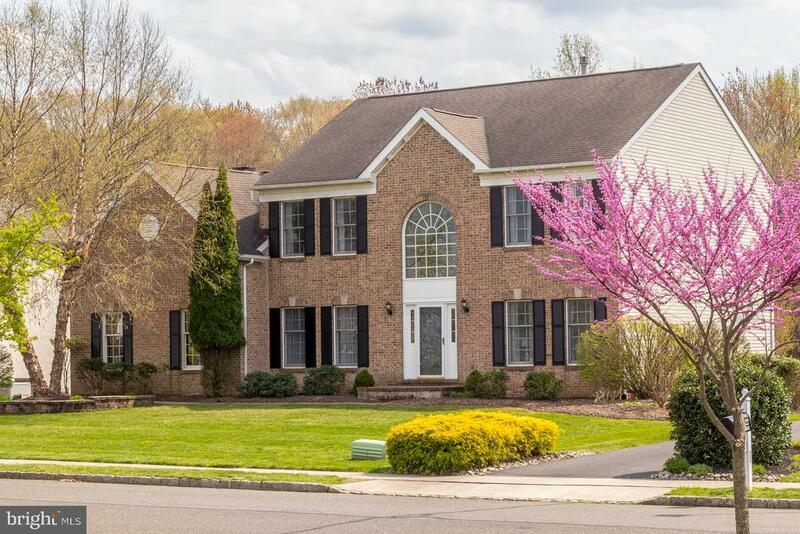 No detail has been overlooked in the design and update of this spacious 4 bedroom/2.5 bath home located in Robbinsville~s prestigious enclave, The Ridings. Beautifully set on 1.5 acres and backing to preserved open space, this inviting home welcomes friends and family with loads of curb appeal- including an expansive front porch, a partial stone facade & a lush, mature landscape! The soaring two-story foyer is flanked by elegant formal rooms with custom decorator details like picture frame and crown molding, plus gleaming hardwood floors. The heart of the home is the gorgeous updated gourmet kitchen! This well-designed space is a chef~s dream, with high-end appliances, endless granite counters, oversized center island with seating, Sub Zero refrigerator, 6-burner DCS range with hood, Miele wall oven, warming drawer, wine refrigerator & handsome solid-wood cabinetry. The adjacent family room is sure to become a favorite gathering spot with its inviting brick wood-burning fireplace. A spectacular sunroom addition is filled with natural light and features a striking stone fireplace, vaulted ceiling and walls of windows offering a picturesque view of the backyard oasis! The second floor master suite is sure to impress with an airy vaulted ceiling and a completely updated en suite bath ripped from the pages of a magazine! This luxurious space boasts a large jetted tub, two vanities, a frameless shower & high-end faucets, fixtures and tile work. There is even a two-sided gas fireplace which can be enjoyed from both the bath and bedroom! Three more generously-sized bedrooms (two with hardwood floors!) and a sparkling fully updated main hall bath complete this level. More living and entertaining space can be found in the roomy finished basement! This area offers multiple areas for relaxation and home office, PLUS a dedicated exercise room. 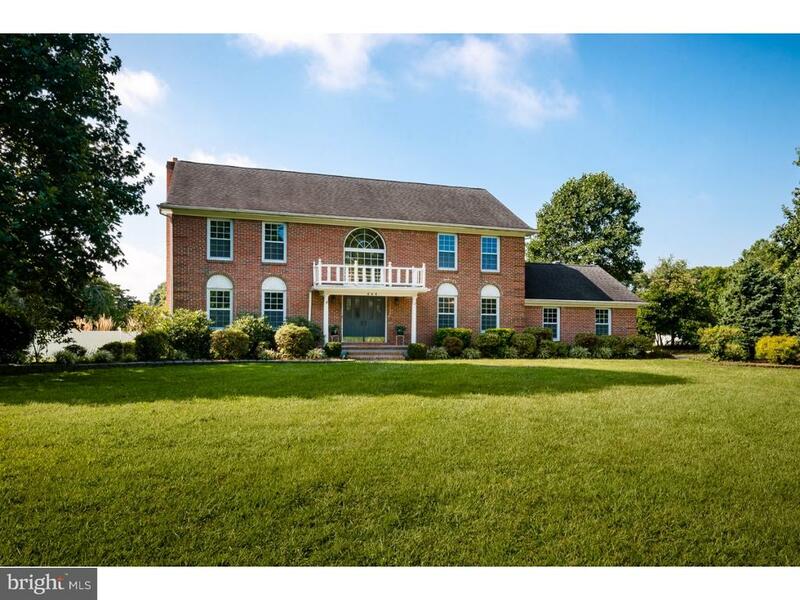 Lucky new owners can look forward to making countless memories in the fabulou"
"Large home in Cranbury Estates on a Cul-da-Sac in Robbinsville Township! Features include a 1st floor bedroom with full bathroom, sun room, large breakfast area, 3 car garage, laundry room, and so much more. Needs some TLC/decorating, but overall in good condition. Employees and family members residing with employees of JPMorgan Chase Bank, NA, its affiliates or subsidiaries are strictly prohibited from directly or indirectly purchasing any property owned by JPMorgan Chase Bank, N.A.. Buyer is responsible for any and all Federal/State/Local inspections and certifications needed to purchase this asset at buyers cost. This is an as-Is Sale, and no repairs or concessions will be made." "Welcome to this better than new home in Springside at Robbinsville, the newest, single family home community in the township. Only one year young, this home has many upgrade that you will not find in new construction homes. This is a Sylvan model Carriage Home with over 3,200 Sq feet of living space with formal living and dining rooms on either side of the foyer. The casual living spaces include an expansive kitchen and breakfast room which are open to the family room with fireplace. Also, there is a main floor master suite with a walk in Closet and master bath with double sinks and shower stall. A laundry room, Costco room/pantry, and drop zone with access to the 2 car, attached garage, complete the first floor. Upstairs you will find a flexible loft space that can be used as an office or additional living space. Bedroom 2 has a large walk-in closet, access to additional attic storage space and a full bathroom, which is also accessible from the hallway. Bedroom 3 includes a walk-in closet and en-suite bathroom. The new owners will have the opportunity to finish the full basement to their liking. However, it is already separated into two spaces with some drywall completed. There are many builder upgrades, including upgraded granite, tile flooring, and hardwood flooring and more. Upgrades added by the current owners include Hunter Douglas blinds (top down, bottom up), whole house water filter, touch-less kitchen faucet, sprinkler system and professional landscaping/trees, additional exterior water connections (4 total), kitchen backsplash, ADT alarm and ring doorbell, high end refrigerator, washer and dryer, LED lighting, and wifi garage door access. The back yard is completely fenced in and the patio has been extended. Located in the highly rated Robbinsville School District and close to train stations and major highways make this the perfect place to call home." "Presenting this outstanding expanded Downes model, with over 3,300 square feet and a three-car garage, situated on a cul de sac in desirable Beechwood Acres. The two storey foyer welcomes you with a Palladian window and hardwood flooring that leads into the crisp white kitchen with granite countertops, custom backsplash and stainless steel appliances. Enjoy informal meals in the eat-in area overlooking the lush backyard bordered by trees. Gleaming hardwood floors and attractive mouldings are found in the banquet sized dining room, plenty of room for large parties and entertaining! Hardwoods continue in the living room and the family room which features a gas fireplace with granite surround and handsome mantle as the focal point. Tucked away on the first floor is an exceptionally spacious office, perfect for work at home and versatile as a private guest room with an adjacent half bathroom, that could be modified to a full bathroom if desired. The upper level offers the Master bedroom en-suite with large light filled bathroom, featuring a jetted tub and separate shower. Prepare to be wowed by the sensational enormous closet plus fantastic storage space. Adjoining the Master suite is an additional room, which can serve as a convenient nursery, second office, a private gym or just a retreat to enjoy a book or quiet meditation. Three additional bedrooms, one with a walk-in closet share the hall bathroom. Minutes to train stations for commuters to New York and Philadelphia, and easy access to major arteries and to the Town Centre. Shopping, restaurants and wonderful parks are at your fingertips and the excellent Robbinsville schools. Come and join this wonderful community and make this your lovely new home!!" "Come take a tour of this Expanded Eaton Model home in the desirable Toll Brothers Community of Washington Greene in Robbinsville Township. This spectacular brick front colonial is 3,100 square feet with beautiful natural lighting throughout. This North-Northeast facing home will capture your attention the moment you enter through its front door! The kitchen was redone three years ago with granite countertops, hardwood flooring, and stainless steel appliances. Off the kitchen is a beautiful sunroom to relax in and enjoy the amazing private view. Venture out the new backdoor to the custom paver patio with hot tub to enjoy some quality relaxation time! Property backs to wetlands! Other first floor highlights are a family room with vaulted ceilings, large windows, and gas fireplace, living room and dining room with stately columns between, great den that could couple as an extra bedroom, laundry room, and powder room. You will be surprised when you venture upstairs to the master bedroom! With a bonus room, two large walk-in closets, and an oversized master bathroom you will find yourself with plenty of living space. The rest of the upstairs boasts three generously sized bedrooms and a main bathroom. The full finished basement with oversized windows has plenty of room to enjoy all year long! New water heater and new upstairs HVAC system! Many more amenities to see!" "New Price!! 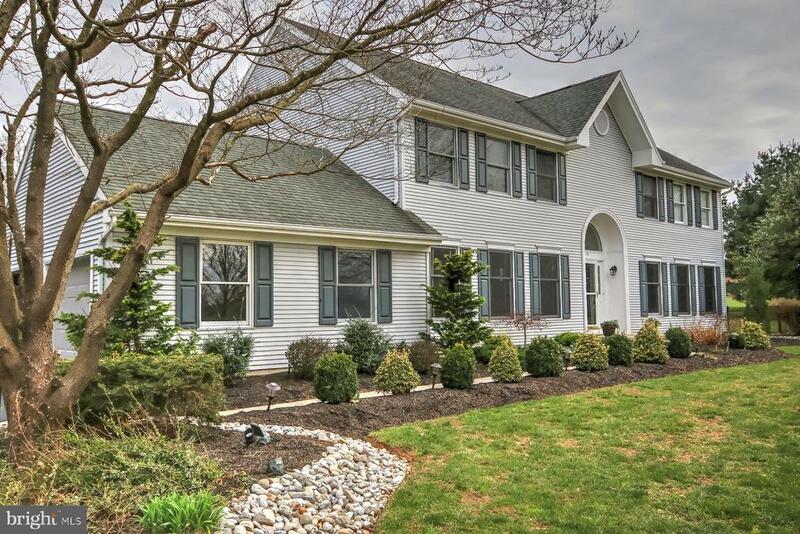 Priced to sell - Exquisite Pristine Custom built Colonial in the heart of sought after Robbinsville Township. This 4 bedroom/2.5 bath Spruce II home proudly sits on a premium lot nestled in a cul de sac, in the desirable Crestwood Acres Development. Pride of ownership prevails. Prepare to be inspired and impressed. Brick front surrounded by ambiance lighting and picturesque landscaping. Dramatic 2 story foyer, 9' ceilings, custom moldings, ceramic tile at entrance, and recess lighting throughout. First floor study is carpeted and could be additional bedroom/ in-law suite. Enter to a formal living room with gleaming hardwood floors flowing to elegant formal dining room with decorative columns, crown moldings and abundance of sunlight. Remodeled gourmet kitchen highlights beautiful granite counters, granite center isle, recess lighting, stainless steel appliances, oak cabinets with crown moldings and new tile back splash. Kitchen eat-in area boasts a breakfast bump out with sliding doors, facing beautiful view of pool and patio area. Warm and inviting family/great room with full stone gas fireplace and raised hearth. Cathedral ceilings and skylights with natural sunlight. Convenient first floor laundry with newer whirlpool washer/dryer. Upper level with overlook to foyer, elegant and spacious master suite with sitting room and cathedral ceilings, large walk in closet and luxurious master bath with Bijou corner whirlpool jacuzzi tub, skylight, separate shower, tile floor and double sink and vanity. 3 additional nice size bedrooms with closet space and a full hall bath. The sophistication continues to an outdoor paradise with a beautiful custom inground salt water pool with safety cover. Gorgeous EP Henry paver, mutli level patio-surrounding pool area and separate landscaped patio area with firepit. Perfect for entertaining. Spacious yard with rod iron fence, ambiance lighting and professional landscaping. 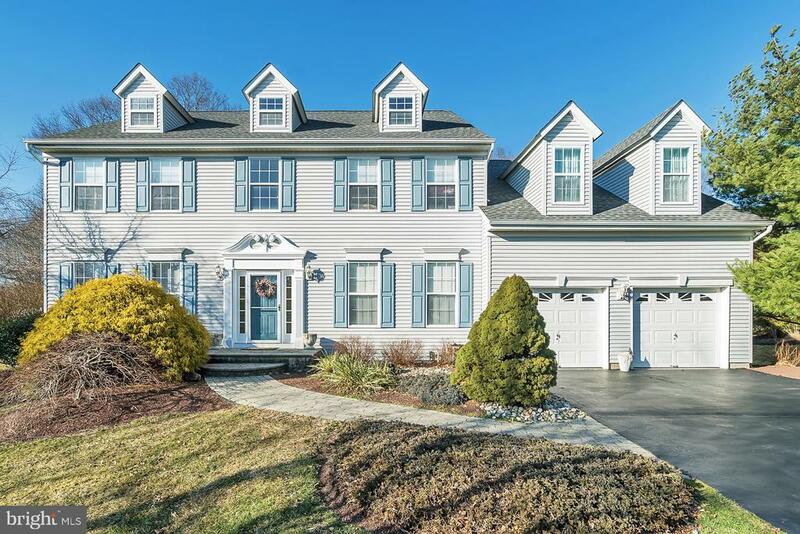 Full basement with endless possibilites and lots of "
"Newly Listed 4 Bedroom, 3.5 Bathroom, Colonial Style Home w/2 Car Garage, in Award Winning Robbinsville School District! This home has been meticulously maintained and features many new/upgraded items including a New Roof, New Finished Basement w/Full Bath, New HVAC, New Paint Throughout Entire House, and a New Weatherproof Deck. The kitchen has been upgraded with new granite counter tops and stainless steel appliances. It is also open to the den, which features a wood burning fireplace. There is wood flooring throughout the main level of the home, as well as in the finished basement. The new finished basement has plenty of space with a full bathroom and kitchen area! The upper level features 4 large bedrooms including a master suite with a Jacuzzi and separate stall shower, as well as a large, main hallway bathroom. The backyard features a deck with an in-ground Gunite (cement) pool (including new pool pump and plaster). Aluminum fencing also encompasses the backyard, which extends an additional 20 ft past the back section of the fence. Excellent for possible future extension of the current yard. Also make note, if you work in either NYC or Philadelphia, this property is less than 1 hour from both. Schedule your showing today, before this home is gone!" 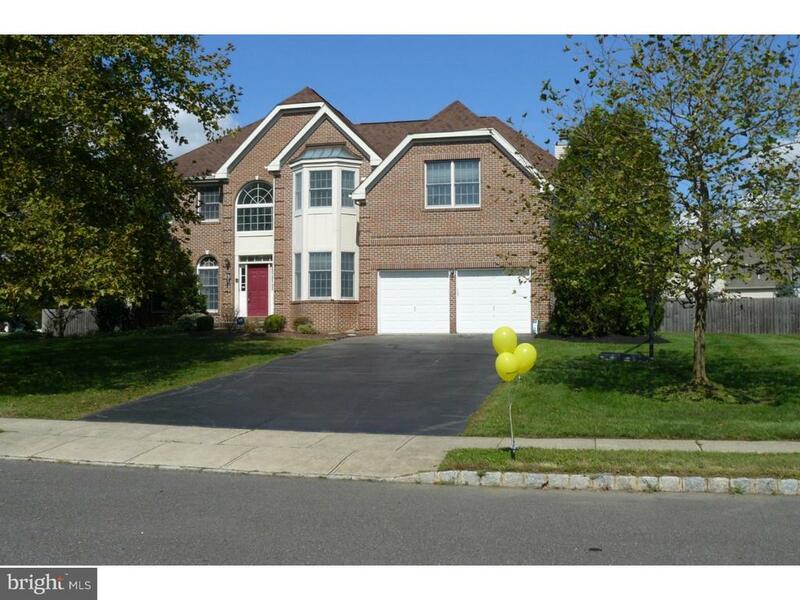 "IMMACULATE, UPGRADED COLONIAL, PRICED TO SELL! Beautifully maintained center hall colonial with updated kitchen, walk-out finished basement and park-like backyard perfect for entertaining! Beautiful sunroom was added on to this Dunhill Model when built new in 1997. The upgraded eat-in-kitchen features beautiful wood cabinets with crown moldings, full stainless appliance package, tumbled marble backsplash, granite counters, and beautifully tiled floors. The wood burning stove warms the family room and gorgeous sunroom opens onto the rear deck overlooking the beautifully landscaped yard. Master suite has vaulted ceiling, walk-in closets and full private bath. The full walk-out basement and garage offer plenty of extra storage while the furnace /AC are brand new. Roof was replaced as well. This home will not last!!" "Welcome to the Woodside Development located in Robbinsville Township. 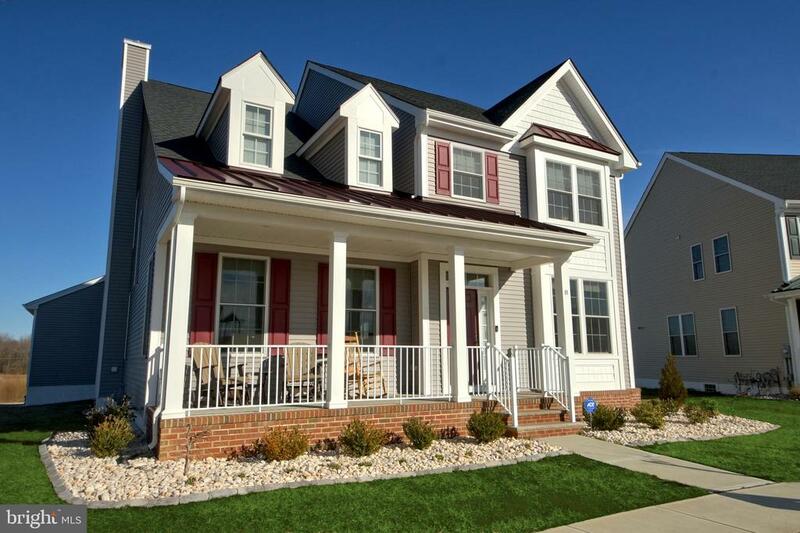 This Augusta model colonial has beautiful curbside appeal and over 3000 sq. ft. of living space with many added extras.The first floor has a 2 story entrance way, 9 foot ceilings,hardwood entrance floor and a dramatic curved staircase to the second floor. The huge eat in kitchen has granite counter tops,tile back splash, upgraded cabinets,built in wine rack,intercom to 2nd floor, large pantry, and a center island with a built in stove top. The first floor continues with a spacious living room,dining room, study, and a great room with a gas fireplace,2 sky lights plus a staircase going to the second floor.Upper level contains the Master bedroom Suite which includes a sitting area.a large walk in closet and master bath with jacuzzi and stall shower (additional storage space in bathroom). Three other large bedrooms and a full bath complete the upstairs.Carpeting in the study,great room, dining room ,living room,guest bedroom and upstairs foyer have been replaced. In addition there is fully finished carpeted basement with lots of storage space. Enjoy those summer,fall and spring days and evenings on the lovely deck that overlooks the large fully fenced in back yard." "Exquisite Custom built Victorian home nestled on a beautiful wooded parcel. 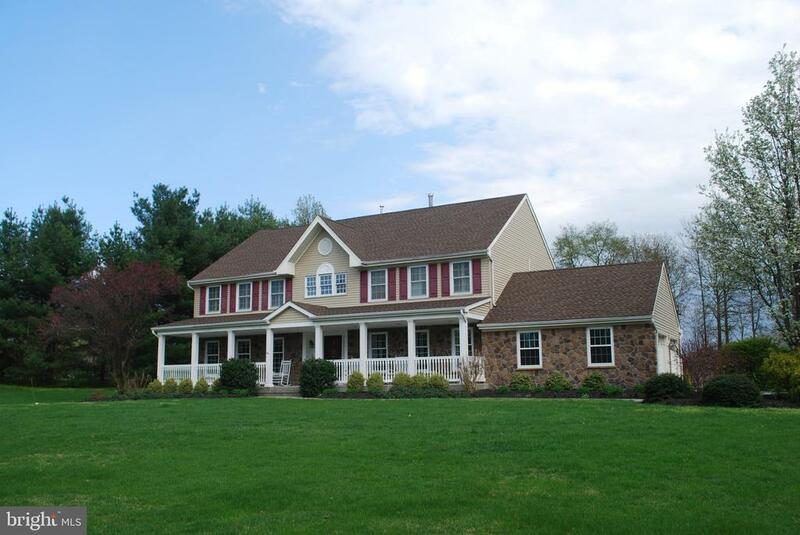 Prime location situated in the heart of sought after Robbinsville Township. Home is set back and sits proudly on 1.53 acre lot. Front of home boasts a wrap around porch with Mahogany flooring. Serene surroundings and picturesque views. This home boasts 4 bedrooms, 2.5 bath, 3 car side entry garage with 9' bays, 12' ceilings, radiant heated floors and extended storage. 4th car detached garage at back of property suited for business owners, contractors work vehicles and/or a work garage. Entrance to property via an extended driveway with plenty of parking. Victorian porch leads to entrance to formal living and dining room. Living room with pocket French doors opens to charming family room with gas fireplace and French doors to beautiful yard area and paver patio. Hardwood flooring at foyer flows into kitchen area. Spacious gourmet kitchen with 42 oak cabinets, breakfast eat in area, center island with bar sink and more cabinets, corian counters and a new 5 burner stove. Convenient 1st floor half bath off kitchen and laundry room with sink and access to the 3 car garage. Tour continues to upper level-Master suite with spacious master bath and large walk-in closet. 3 additional oversized bedrooms with lots of closet space and organizers and a full Hall bath. Lower level finished basement -lots of storage, recreation area, Radiant heated floors throughout and walk out access to 3 car garage. Home has 4 zone heat, 2 zone A/C, 4 thermostats and extra attic storage. 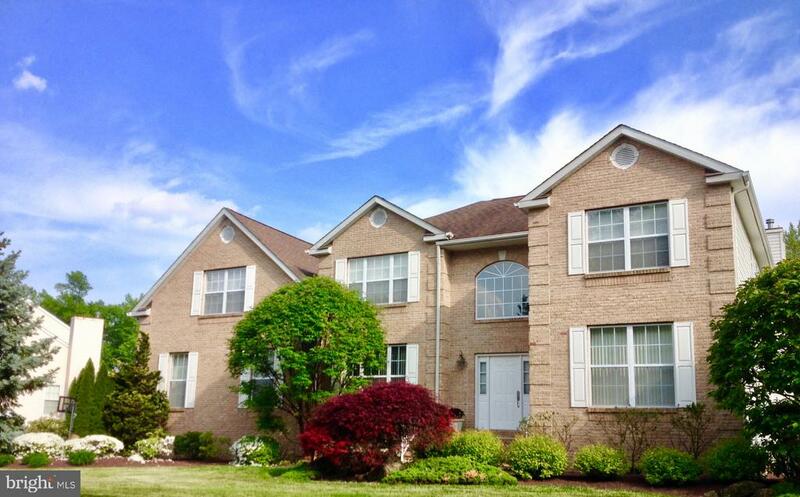 Great location, excellent Robbinsville Schools, easy access to transportation, highways, NYC and Philadelphia. Close to shopping. Welcome Home!" 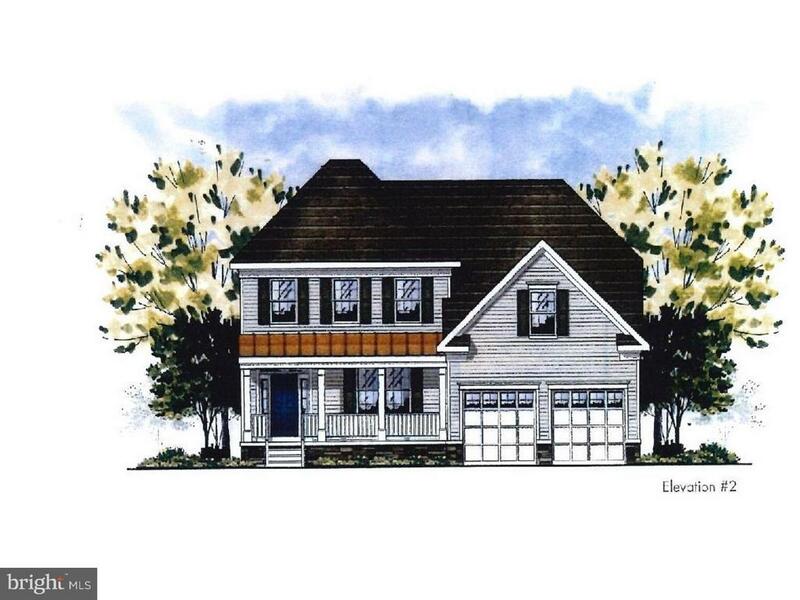 "NEW CONSTRUCTION, ONLY A FEW LOTS REMAINING, TO BE BUILT in the sought after Springside at Robbinsville. Don't miss your opportunity to own this 2,650 sq ft spacious Azalea Model situated on a spacious corner lot, with a stone front, finished basement, 3 bedrooms and a loft. Hardwood floors on the first floor. Chef's kitchen includes custom Wolf cabinets and granite countertops. Covered entry, leads to the open and airy living room and dining room. Open concept kitchen and family room perfect for entertaining with optional fireplace. Costco room off the kitchen for easy access and storage. On the second floor, the master suite includes a walk-in closet and private master bath. Two additional bedrooms share a hall bath, and a loft and a laundry room round out your upstairs living space. 20% off upgrades (already included in your price), free finished basement. Take advantage of the community pool and clubhouse, snow removal and common area ground maintenance. Two car garage and a finished basement. Conveniently located near all major highways, train stations, shopping, restaurants." 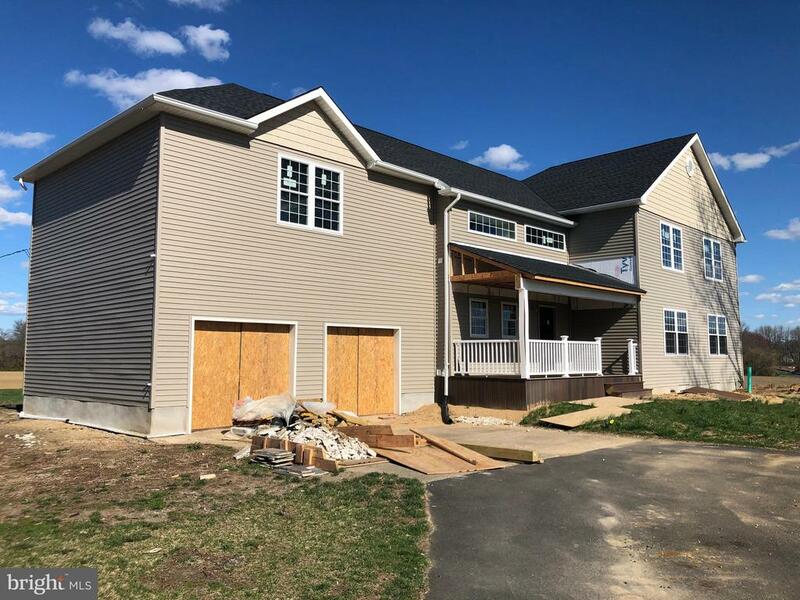 "NEW CONSTRUCTION, TO-BE-BUILT One of the last opportunities at Springside, in Robbinsville, this Harmon model will be upgraded with a wrap-around porch and an East facing front door. The home will be complete with hardwood floors on the main level. This home's kitchen will be finished with Wolf cabinets and granite counter tops. The floor plan offers a 1st floor Costo room and a 2nd floor laundry room. The master suite includes a walk-in closet and master bathroom. Two more bedrooms share a hall bathroom. The spacious Loft completes the 2nd floor. Incentives include a free, partially finished basement and 20% off upgrades (already included in price.) HOA fee includes use of the outdoor community pool, community clubhouse, common area ground maintenance and snow removal. Springside is centrally located close to major highway, train stations, shopping, restaurants and highly rated Robbinsville Schools. Hurry before it's gone." "NEW CONSTRUCTION. TO BE BUILT. One of the last opportunities to own a home in the desirable community of Springside in Robbinsville! This beautiful, brand new 2650 sq. ft. 3 bedroom, 2.5 bathroom Azalea model is loaded with luxurious features including hardwood floors, white Wolf cabinets, quartz countertops and stainless steel appliances in kitchen, Costco room on the first floor and laundry room and spacious loft on the second floor. Master suite includes two walk in closets and large master bathroom with double sinks. Incentives include free finished basement and 20% off upgrades already included in the price! HOA fee includes use of community pool, clubhouse, ground maintenance in all common areas and snow removal from common streets, alleys and common parking areas. 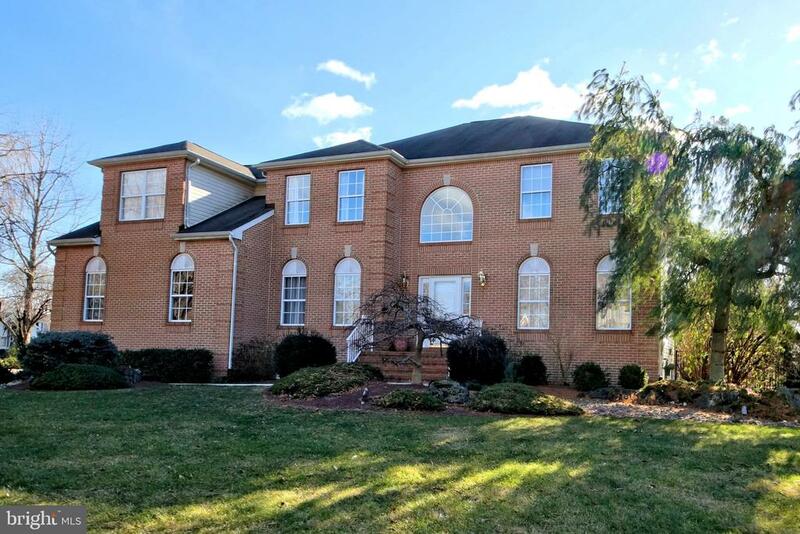 Great location, close to major highways, train stations, shopping, restaurants, and highly rated Robbinsville schools. Be a part of this wonderful community!" "Three countryside acres enfold this brick-front Colonial, romantic with a wisteria-canopied patio, free-form swimming pool, and lovely tree-bordered lawns that host a pole barn with 2 horse stalls. Elegant rooms wrap in warmth, from a coffered dining room, holiday-sized living room, and to a fireside family room - all with hardwoods. A beautifully renovated kitchen and vaulted breakfast room start the day with sunshine, and a bounty of modern amenities like a 2-drawer Fisher Paykel dishwasher tucked into a long prep island, and a sparkling glass tile backsplash. Household matters are handled by the laundry room/home office, handy to a half bath. A finished basement with a full bath offers a separate gym and bonus room. 4 sun-scrubbed bedrooms are served by 2 recently renovated baths; the luxurious master retreat pampers with walk-in and shoe closets, plus a vaulted, skylit en suite anchored by a corner tub and frameless glass shower. A commuter's dream, with minutes-away access to the train, NJ Turnpike, and 295/195. Top Robbinsville Schools!!"